Today is the fourth day of Christmas. Today we continue to welcome the arrival of the incarnate King—the Word made flesh. Today we continue to give gifts to our children and to sing of the birth of the Second Adam. Today we again raise our glasses and our voices in celebration of the event that marked the beginning of a new humanity—the beginning of all things made new. Today our spirits rejoice in God our Savior who has visited us in our low estate. 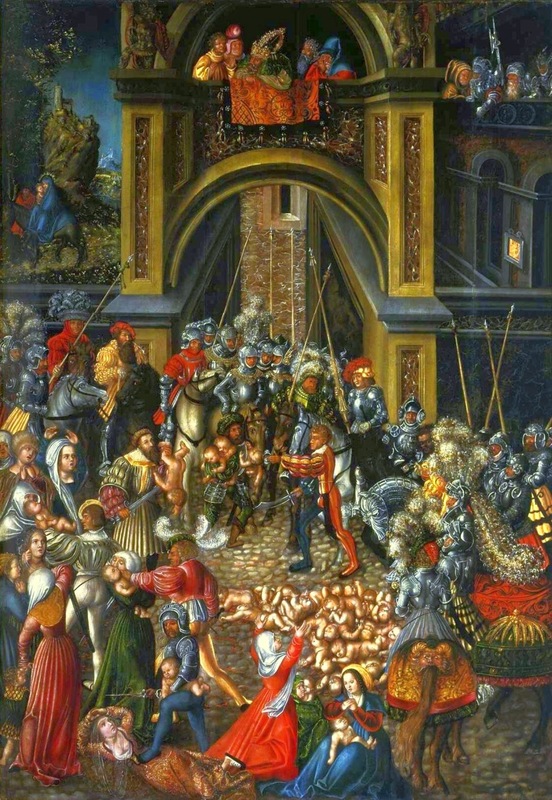 Today is also the Feast of the Holy Innocents—a day that, according to the church calendar, commemorates the massacre of the infants by king Herod following the visit of the magi. Today, many churches around the globe remember that loud lamentation—the voice of Rachel weeping for her children because they are no more. Today is the collision of two feast days, one of joy and the other of mourning. And today, I feel both the weight of that glory and the weight of that grief. Last night, as I lay awake next to the low hum of the humidifier, trying to relieve the pressure from a splitting sinus headache, I received a Facebook notification on my phone—a friend asking for prayer for her son and husband who were lost in the dark and snow on a mountainside in central Idaho with a search and rescue team sent out to find them. My heart raced. Jayson and I had just spent the afternoon driving slowly home from Spokane and knew how icy and treacherous the highways were. We ourselves had slid on the road and seen cars being towed from snowy ditches, and I could only imagine how much more dangerous the driving conditions must be on a winding mountain road. We prayed for the safe return of these two men and for peace for my friend as she sat up during the long, dark hours waiting for news. Still unable to sleep, I read another prayer request sent out by yet another friend. This time, my heart fell into the pit of my stomach. Earlier in the day another friend of mine and her husband had left home with their daughter, a former classmate of Jonah’s, to drive her to Montana for a visit with friends. As they drove on those same icy, snow-covered roads, they were involved in a collision that injured my friend, but that killed their daughter instantly. I spent a good part of the night with an aching head and a breaking heart, praying and praying again for these dear families—and particularly for these mothers. Both of these families have already suffered through tremendous trials, long periods of uncertainty, and pain of body and spirit. And yet both of these families, in the middle of their various struggles, have shown all of us what it looks like to have joy in the midst of trouble. These mothers in particular have been an ongoing example to me of selfless love, steadfast patience and joyful encouragement—women who pour themselves out to bless those around them. As I prayed, I wondered, not for the first time, at the sudden and severe providences of God. I know that at times like this, Reformed Christians like me tend to toss Romans 8:28 around like some kind of magical band-aid: God works all things together for the good of those who love Him, so turn that frown upside down! But trusting in God’s mercy and kindness, believing that He is doing good in the direst circumstances, is not always an instant cure for a broken body or a breaking heart. Does the reality of pain and death undo the truth of that verse? No. But I also cannot pretend to know exactly how God is working all things for our good. Why must these families, of all people, be given this additional weight to bear? Why this? And why them? I don't know the answer. But I remind myself that God is working for the good not only of those who suffer but also for the good of those who are witnesses to their suffering. Knowing how these women, these friends of mine, have repeatedly expressed their deep trust in the goodness of God while facing life-altering trials is something that has certainly worked for good in my own life. In many ways, it's through seeing the example of other suffering saints that I found courage to face smaller trials in my own life—and that prepared me for facing some of the hardest days of Jonah's cancer treatment. For that I am grateful. But knowing that God is doing good through these hard moments does not mean that the moments cease to be hard. How many times have I have bitten my nails in fear or felt tears welling up with sadness during the most harrowing moments of a good story—a story that I already knew would have happy ending? Knowing the end—knowing the good to come—does not take away the tension or the tears. How much more so when the story is the one lived out before our eyes in real time? If even Jesus, who knew that Lazarus would soon step out of his tomb alive, wept at the death of his friend, we might weep as well. The valley of the shadow of death is a place none of us hope to find ourselves. And yet all of us will walk through it sooner or later. As I lay awake last night, I ached for my friends who were walking there at that very moment. God does promise to be with us in that dark place, but He does not promise to swoop in and remove us from it. He may not take us out of the presence of our enemies. But He does prepare a table before us there—even in the presence of the last enemy. God is working all things for good. Can it be true? Even this? Even cancer? Even loved ones lost on an icy mountainside at night? Even (I can hardly type the words) the death of a child? All things working together for good? All things? I still believe it. It is peace and comfort. It is a hope that, in these dark hours, keeps us from despair. But it is not an anesthetic that can be clinically injected into our troubled souls to immediately take away the pain. It is Christmas. During this season, we remember with joy that the Light has come into the world. But this day also reminds me that the story does not end there. Light did come, but the world did not comprehend it. The Lord of Glory was born into a dark world that would spill the blood of the innocent—and that would, in the end, spill the innocent blood of the Son of God Himself. The sky would go dark. The earth would shake. And through those hours of deepest darkness, when the Light of the World seemed to be extinguished forever, God would, definitively and perfectly, unexpectedly and gloriously, work all things—yes, all things—for our good. This morning, I woke to bright sun shining through snowy branches and sat up, hoping for news from my friend whose husband and son were lost. I checked my news feed and read her update with the report of their late-night rescue with such relief that I cried. I was overwhelmed with grateful joy. And as I thanked God I remembered my other friend whose daughter is no more. And I wept again, overwhelmed by the terrible loss. I was still wiping away tears when my youngest son ran into my room and bounced on my bed declaring, “It’s Christmas again!” And so it is. Oh, tidings of comfort—and joy. Here we are, already at the end of another year full of reasons to be grateful. I'd love to have written a nice, newsy Christmas update to include with all the greeting cards we would have sent out to friends and family this month. Maybe the news update will still happen, but having only just gotten my computer back after two and a half weeks in the shop, I now find myself busily catching up on all the computer work I should have gotten done during that time. 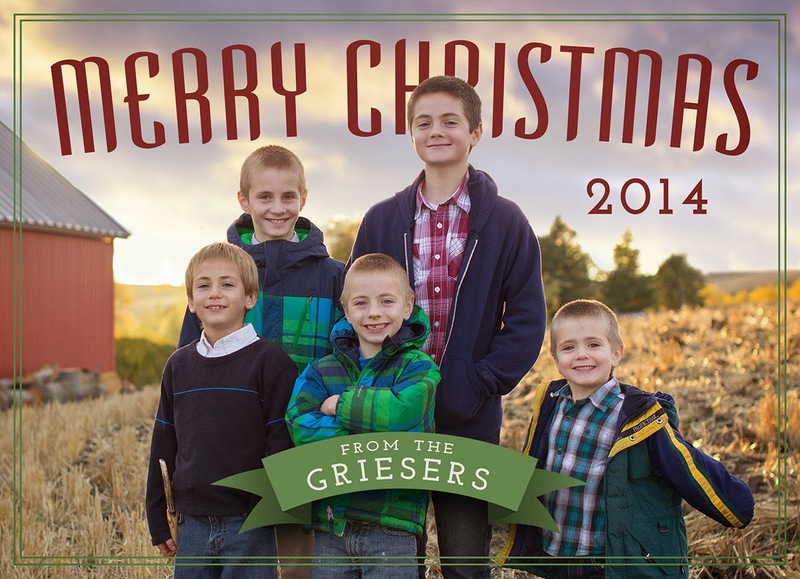 So the Christmas card mailing is not happening this year. It's honestly a bit of a relief to put off all the printing and labeling and mailing until next year, but I'm sorry not to send you all something festive to hang on the refrigerator. Here, however—in digital form—is this year's card, arriving not in your mailbox but in your news feed. Feel free to print it out, stick it on your fridge, and pretend it came with a stamp! Many blessings to you and your families this Christmas!